God bless whoever invented the traditional electrical outlet so many decades ago. Where would we be without the ability to conveniently tap into some current every ten feet or so? Problem is, the outlet we’ve come to depend on is decades old…born long before rechargeable razors, curling irons and baby monitors began fighting for plug-in supremacy. We live in a time where a lot of the electrical products that add convenience to our lives (many of them cordless) come with bulky plugs. History’s greatest revolutions are borne out of society’s desperate need for change. If you’ve ever tried charging two cell phones in the same outlet you know what we mean. It just so happens that this particular revolution is particularly about revolution. For the first time in history, the sockets in your wall outlet can actually rotate 360°, providing the flexibility needed to make full use of both outlets. 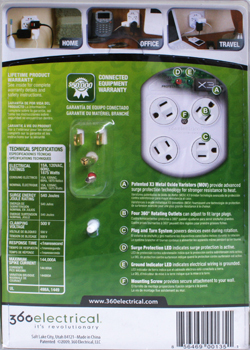 360 Electrical’s patented design allows you to connect that large plug and just give it a turn to make space for another plug in the same outlet. We call it “plug and turn.” Both the top and bottom sockets rotate in either direction a full 360° so you’re sure to find a configuration that works. — Ships from Portland, Oregon USA. 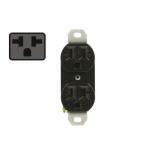 For more information, please visit the manufacturer 360electrical's website. 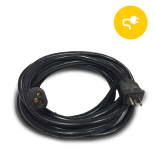 240v Extension cord with 3 outlets - 12 ft. 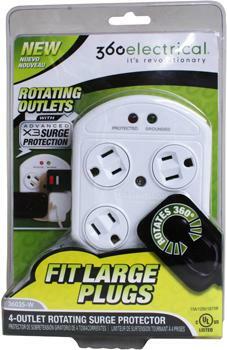 Most Viewed in Electrical - Extension Cords, Cords, Taps, Outlets, Power Strips, etc. 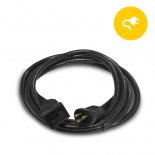 240v Extension cord with 3 outlets - 25 ft.